Kimberly works on Claybord, although she is quite familiar with Scratchbord and had used it prior to finding the Claybord for her scratch art. The difference between the two is the working surface; Scratchbord has black india ink as a top coat, and the Claybord is a white kaolin clay smooth surface. Kimberly prefers to apply her own ink to her drawing, so that she can determine how to develop her composition. 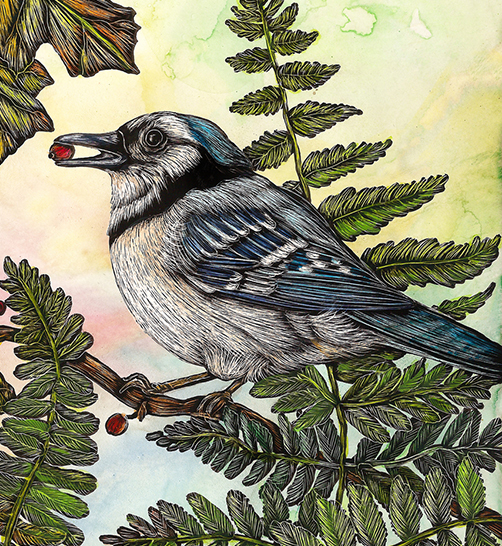 Her technique enhances the brilliant color in her work, which she creates with a combination of watercolor, Claybord Inks and Faber Castell Ink markers. “I used to ink all my pieces with Speedball or Higgins India Ink, but then I was reading a blog about Faber Castell ink markers and it all came into place. My life has been wonderful since, I now use the back india ink marker to make my black composition on the Claybord, and it is so much easier to scratch. Along with my watercolors and Claybord ink, I use some of the markers in coloring the pieces,” she explains. 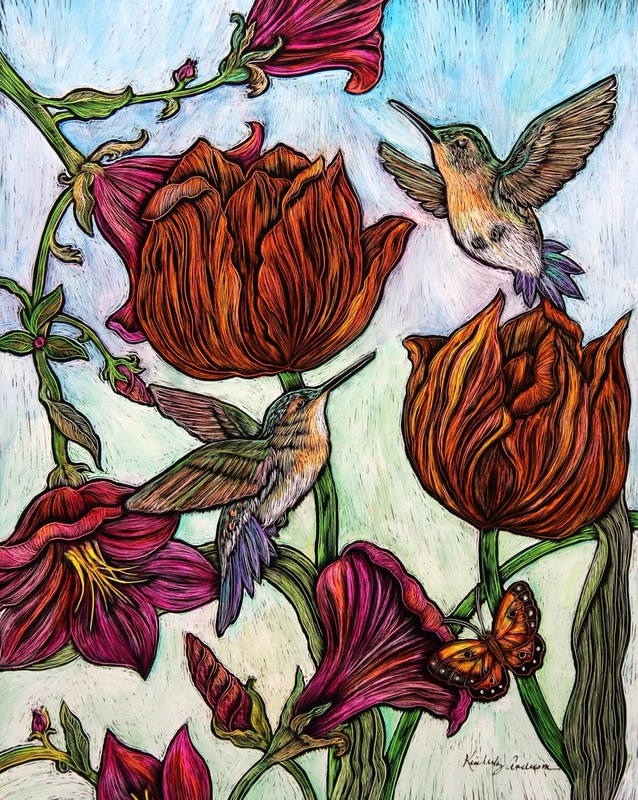 Kimberly has an upcoming exhibition at the Mountain Made Gallery in Asheville, NC for the month of August and a demonstration there on August 8th, 2015. 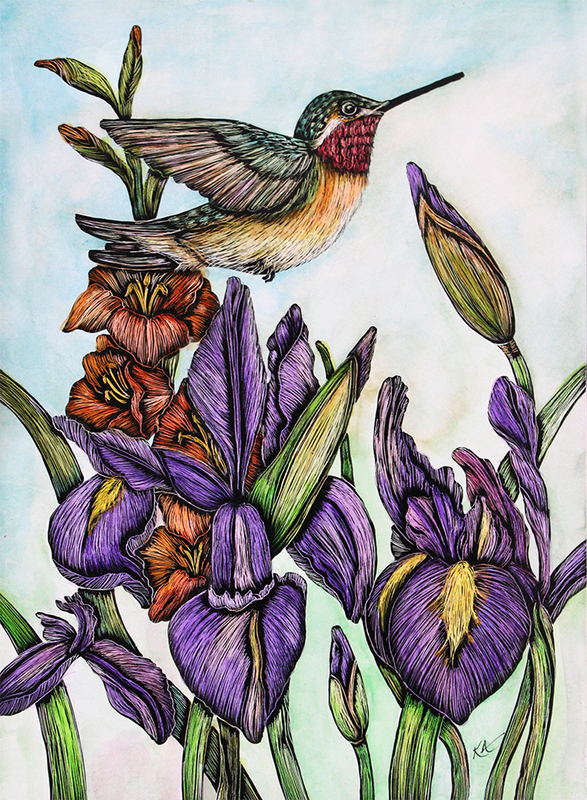 She also teaches silk painting monthly at the Art MoB Studios in Hendersonville, NC. You can also find Kimberly’s work in the Mountain Nest Gallery in Black Mountain, NC and the Art MoB studios on Hendersonville. Kimberly also keeps her current work on her website and shares more about her process through her blog.